With the 22 fresh projects in Make it! 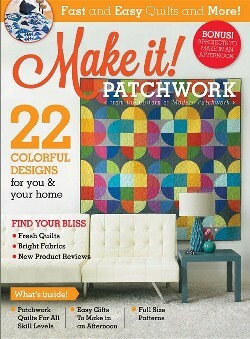 Patchwork, you are sure to find several sewing patterns you can't resist. Make coasters from your favourite fat quarters, stitch some retro fabric into a trendy market tote, or piece some flying geese into the “Flock of Seagulls” quilt. Whether you are looking to make a quick project to finish in an afternoon (and this issue has nine of these!) or want to set aside a few weekends to make a full-size quilt, this special issue magazine features a wide variety of patchwork patterns to inspire you.